Arizona Sonora Desert Museum. Hummingbird Exhibit. The Arizona Sonora Desert Museum is considered the nation’s hotspot for viewing hummingbirds. If you love hummingbirds, we definitely recommend a visit here. The hummingbird aviary is a walk-in adventure. Due to its proximity to Mexico, Arizona is among the best places to see a variety of hummingbirds. Many species of hummingbirds live in Arizona and they all can be seen close up at this aviary.The exhibit is a re-creation of the natural habitat of approximately 17 hummingbirds at one time. This world famous attraction allows you to walk around freely. The Aviary's propagation program at the Arizona Sonora Desert Museum enhances the conservation of these birds and is the only one in North America. You will see that many of these hummingbirds are being rehabilitated for injuries sustained in the wild. Some species generally included are Anna’s, Costa’s, Rufous, Black-chinned, Broad-tailed and others. Although many hummingbirds die during their first year in nature, at the Museum some live as long as 12 years. It is interesting to note that the Museum’s Hummingbird Exhibit was originally built in 1988. It was later renovated after sadly discovering an infection of iron storage disease in the hummingbirds. Now, double in size, the current exhibit is 3300 square feet. Visit Mr.TinDC's flickr page for some wonderful hummingbird photos. Of special note: You can make a reservation for a tour that allows you to view the hummingbirds close-up. Wouldn’t you enjoy seeing the tiny hummingbird nests? Without a webcam, these can be very difficult to see in nature but here at the museum nests are here to view. We know how climate affects hummingbirds. This is the reason the climate is watched carefully here. Even Arizona can experience extremely cold temperatures and heat lamps are used when this happens. The native plants are hosed down daily so the hummingbirds can brush against the leaves to clean their feathers. Also, an artificial stream of water was constructed to satisfy their need for H2o. During breeding season you can actually watch "nest building". The aviary is well supplied with feathers, spider webbing, moss, and fur from the museum's Big-horned sheep. Besides nesting, when visiting this aviary you can observe just about every hummingbird behavior. Visitors can watch them hover at the brightly colored native flowers, listen to them make hummingbird sounds, catch insects in mid-air and perform mating displays. No binoculars are needed here, these birds simply ignore our presence. 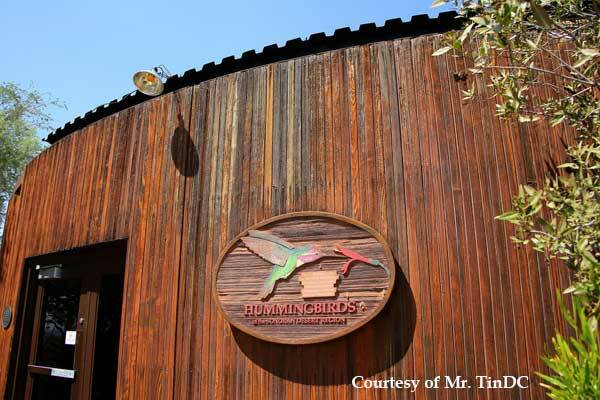 Any hummingbird lover would enjoy a trip to Arizona to visit this wonderful aviary.